What does freedom mean to you? Do you sometimes take your freedom for granted? Every day, Juan Marante counts his blessings; he never takes his freedom for granted. 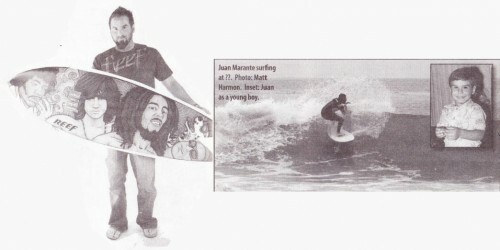 Marante is a graphic designer at Reef and also paints amazing pictures on surfboards. He has designed boards for pro surfers like Bron Heussenstamrn and even designed two boards, pro bono, for Bethany Hamilton. This goofyfoot’s roundhouse is solid, as evidenced by a recent session at Boneyards, where I recently met up with him. But had Marante and his family never left Cuba, he most likely wouldn’t be surfing today, or skateboarding or enjoying many of the freedoms that we have in this country. Marante’s journey from Cuba to the U.S. wasn’t a joyride. It involved an arduous nine-day internment at a camp called El Mosquito, where a then fouryear old Marante nearly lost a limb to gangrene. Marante doesn’t remember much about the mass exodus of over 125,000 Cubans in 1980. But his parents, who live in Miami, along with most of the other Marielitos (the exodus is known as the Marie! boatlift), remember vividly what life was like after Castro took power and their experience at El Mosquito, followed by a hellacious, rickety-boat ride to the U.S.
Before Castro assumed control in Cuba, Marante said his family was well off. But after Castro took over and seized all private business and land, Marante’s family experienced a reversal of fortune. “We went from having a big house with live-in help in pre-Castro Cuba, to having almost nothing,” said Marante. It took Marante’s family about 10 years of living in the U.S. to get out of poverty. “We moved from ghetto to ghetto in Miami for many years,” remembers Marante, who has been living and surfing in San Diego for six years. Living in the U.S. has allowed Marante the freedom to make a living combining two passions: surfing and art. In addition to his Reef gig, Marante paints surfboards for Rip Curl, Sharp Eye and AKA. He also creates custom-made surfboard art. His website, www. tocayodesign.com, features a Jirni Hendrix caricature in psychedelic blue hues. It resembles 60′s rock poster art from the Fillmore. He also painted a board for Joel Tudor’s cousin of a young, wailingaway James Brown. Marante can do more than paint music legends. Mermaids, Japanese Shogun warriors, Rastafarian angels, and even The Dude and Walter from the movie “The Big Lebowski” have been featured on Marante’s polyurethane canvases.